There was hardly a hangover after the London Olympics. With records, upsets, and lots of youth talent emerging, 2013 was a year for the history books. My men’s and women’s rankings took a look at the top performers, but there were many more moments to remember. Here is my list of the biggest hammer throwing stories of 2013. 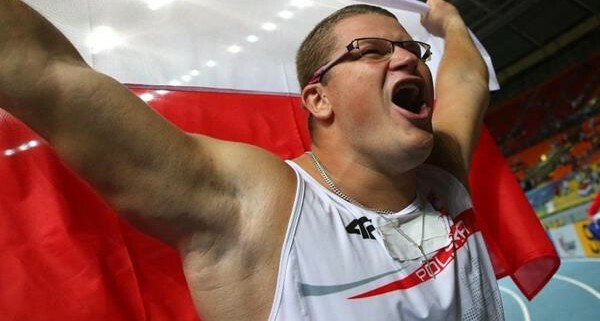 Pawel Fajdek announced himself to the world with his world title in Moscow. 1. 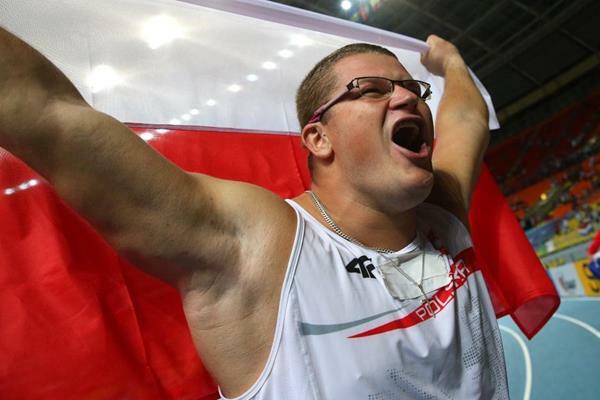 Surprise Winners at the World Championships – Those outside of the hammer throwing world likely had never heard of Pawel Fajdek, the young Polish thrower. Insiders knew he was a rising star, but after fouling out in London he had yet to make his mark at a major championships. Krisztian Pars was undefeated and a clear favorite entering the world Championships, but Fajdek came out firing and led from start to finish with a new personal best of 81.97 meters. At just 24 years of age, this will be the fist of many World Championships medals for him. Just like Pars, Betty Heidler entered the women’s competition undefeated but unlike Pars she failed to even make the finals (more on this below). As defending Olympic and World Champion, Tatyana Lysenko was hardly an outsider but was still an underdog. And for the third year in a row she turned that underdog role into gold. 2. Women Put on a Competition to Remember – Combined, the stellar men’s and women’s competitions made this year’s world championships the most exciting that I have ever seen. I risk overusing this phrase, but the women’s competition in particular was perhaps the best of all-time. I also said this after the London Olympic final when five women broke 76 meters and it took 74 meters just to place in the top eight. The depth was not as good this year, but the competition was better. Lysenko opened the competition with a bomb of 77.58 meters. Since Heidler didn’t make the final and Wlodarczyk opened up with just 70 meters, I thought this would secure the win. By Wlodarczyk slowly started to warm up improving to 74 meters in round two and then took the lead in round three with 77.79 meters. In round four, Lysenko responded with the second furthest throw ever of 78.80 meters. Wlodarczyk then entered the ring and watched her throw nearly surpass Lysenko again. While the throw ended up being a little shorter (78.46 meters), it was still enough to move Wlodarczyk to third on the all-time world list. There were also lots of competition and lead changes for the other positions too. Zhang Wenxiu won bronze, but was only 1.42 meters ahead of sixth place finisher Yipsi Moreno. Five of the top six had season’s best. Three had personal bests. And two set national records. Even the battle to make the finals was close. Position seven through ten were separated by just 20 centimeters with the two Americans missing the finals by just inches. 3. Heidler’s Future in Question – World record holder Betty Heidler was having a great season until she fell apart at the World Championships. This left many people asking questions, but her actions since then have only generated more questions. Other than a mediocre performance at home in Berlin, she abruptly called her season to an end after the World Championships. After the season she had surgery on her left knee. She also uprooted from her longtime training base in Frankfurt to more back home to Berlin. Then the big shocker came after some strange comments in an interview last month, when she said “I will not start again at the World Championships.” She clarified that she does not intend to retire, just to forgo competing at the World Championships. That’s a strange comment and strategy in an era where the World Championships is one of the only chances for a hammer thrower to make money. 4. New American Record – The top American women were huddled around 72 meters for several years until Jessica Cosby finally broke through and set a new record last season. That opened the flood gates and Amanda Bingson shatter the record this season with a toss of 75.73 meters to dominate the US Championships. With two records in two years and a young crop of throwers, it looks like the breakthrough has just started. Bingson had a very strong season overall and placed 10th at the World Championships, just five inches away from the top eight. 5. Strong American Women – Entering last season the American record was 73.87 meters. This year five women were over 73 meters. Along with Bingson, Jeneva McCall threw 74.77 meters and was actually the top ranked American in my world rankings. Gwen Berry, who like McCall is just 24 years old, also threw nearly 74 meters. Veteran Amber Campbell also had strong season and set a new personal best to make the World Championship team. And Jessica Cosby was once again quite strong. It was unthinkable that an American would not make the national team with a throw of 72.39 meters at worlds, but that is just what happened to Cosby as she placed fourth. Not only are the marks increasing, but the athletes are also moving up the world rankings. Based on the yearly performance list, five of the top 18 women in the world were Americans. 6. Winkler Improves the American High School Mark – While the American men have not yet seen , a sign of progress can been seen in the development of youth throwers across the country. Once a seldom contested event, the hammer throw results have taken off over the least few years. This year the national record was yet again bettered by New Yorker Rudy Winkler. Winkler’s best of 79.38 meters (260’05”) from July added five inches to former World Junior champion Conor McCullough’s mark from 2008. Winkler also became the third hammer thrower in the last eight years to be named the Track and Field News high school athlete of the year. 7. Gomez Puts South America on the Map – Argentinean Joaquín Gómez fouled out at the World Youth Championships earlier this summer, but he had redemption this month by setting a new world under-18 best with the 5-kilogram hammer. His throw of 85.38 meters added 12-centimeters to the old best by Ashraf Amgad Elseify set in 2011. This may not be the most impressive throw by a youth athlete ever (Elseify also threw 85.57-meters with the heavier 6-kilogram hammer as an under-18 athlete), but it is still the farthest 5-kilogram throw ever by a youth thrower. South America has lagged behind other countries in the hammer, and Gómez’s results are a good sign that an 80-meter thrower might be on the continent’s horizon. Oceania and South America are the only two areas in the world that have not produced an 80 meter thrower at the senior level. And South America lags the furthest behind with an area record of just 76.42 meters. Oceania is at 79.29 meters. 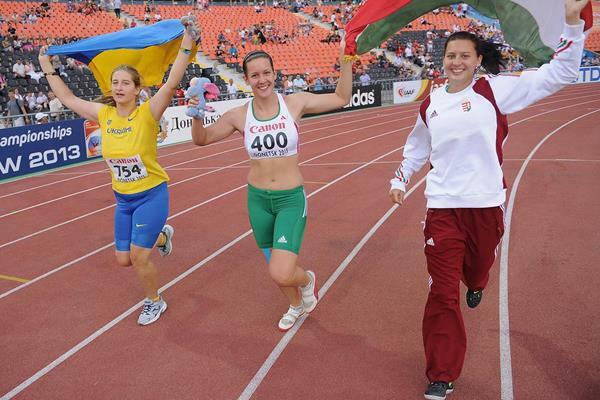 Reka Gyuratz (centre) and Helga Volgyi (right) both broke the old world under-18 record this year. 8. Hungarian Girls Demolish Youth Record Books – Hungrian men have long been winning global medals, but the Szombathely training group run by Zsolt Nemeth now has the two most promising young women’s throwers in the world. Like Gómez, Réka Gyurátz and Helga Völgyi both surpassed the old world under-18 best. Gyurátz’s best of 76.04 meters with the 3-kilogram hammer added nearly three meters to the old mark. Völgyi also posted an impressive 74.38 meters and the easily won gold and silver at the World Youth Championships. Gyurátz then jumped up an age group and threw 65.01 meters with the 4-kilogram hammer to place second at the competitive European Junior Championships. Combined the two throwers have 18 of the top 19 performances of all time in the under 18 category. But their records might not last for long. Their third teammate Zsófia Bácskay already hit 71.76 meters (fourth all-time) and has one more year in the age category. 9. Hammer Challenge Finally Expands – In previous years there were so few meets on the circuit that were grouped so closely together that part of the jackpot remained unpaid since many athletes could not compete in the minimum three competitions. This year the IAAF expanded the challenge to feature 11 men’s competitions and 10 women’s competitions. While this was a great change, it also fell short of fixing the IAAF Hammer Challenge. As I mentioned in an editorial this spring, this only fixed part of the problems. The overall prize money still is minuscule in comparison to the Diamond League and most of the “new” competitions already offered the hammer throw in previous seasons. But with one Diamond League competition officially becoming part of the challenge the change offers a distant hope that more will join in the future. 10. The UK Loses a Legend – On a more somber note the hammer throwing community lost a legend when Alan Bertram passed away in May. The British coach was a die hard advocate for the sport that left an impact wherever he was, like he did with the training groups he led in London and Scotland. When I visited Glasgow in October I heard many stories of his impact on developing the event there. Even in America I remember reading Bertram’s guide to the hammer throw when I was first trying to teach myself to throw. Like Harold Connolly in the US, Bertram was a unique character and the type of people we need more of in this sport. Athletics Weekly had a thoughtful obituary that is well worth the read.